Q: What is Lyft’s Ride Smart program? A: The University of Alabama has contracted with Lyft and their Ride Smart program to give students a safe and affordable ride home during late night hours. Specifically, the program offers discounted rides to all students, faculty and university staff. A program highlight has Lyft offering a 15% off all rides around campus. Additionally, those who enroll in the University of Alabama’s Ride Smart program receive an additional discount off their late-night rides between 9PM and 3AM Thursday through Saturday, subject to published blackout dates, primarily home football game Saturdays. A: There are two steps to the enrollment process. First, you redeem your 15% off all rides around campus 24/7, using code UASGA in the ‘Promos’ section of the app. You will also receive an email invitation from Lyft to enroll in the Ride Smart program. To sign up, you must verify your phone number. Once your number is approved, you will be eligible for an additional discount off late night rides between 9PM and 3AM Thursday through Saturday. Your discount is automatically applied prior to each ride for the remainder of the program duration. Q: How can I check if my account has been activated and my ride discount has been applied? A: Navigate to the ‘Promos’ tab in the app to confirm that both the UASGA and Alabama Ride Smart coupons have been applied to your account. When you request a ride and enter your pick-up and drop-off locations, the upfront price displayed will reflect the discounted fare. Once your ride is completed, your receipt will also display the discount applied to your ride. Please note that the Lyft discount does not apply toward driver tips, taxes, service fees, or other surcharges. Tips added in the app are charged to your credit card on file. Q: I didn’t receive a Ride Smart invitation from Lyft, who do I contact? A: First, check your spam folder to confirm the invitation wasn’t mistakenly identified as spam. If you still cannot find your invitation, please submit a request here. Please allow up to 48 hours to validate your eligibility and confirm enrollment. Q: What’s the total discount I should receive from Lyft? A: If you apply code UASGA and enroll in the Ride Smart program, your total ride discount will be 25% during late night hour rides between 9PM and 3AM Thursday through Saturday and 15% off all other hours. Q: How will I know if my ride is included in the coverage area? A: All rides must start and end within the designated area around campus. Please refer to the full coverage area shown below to learn more. 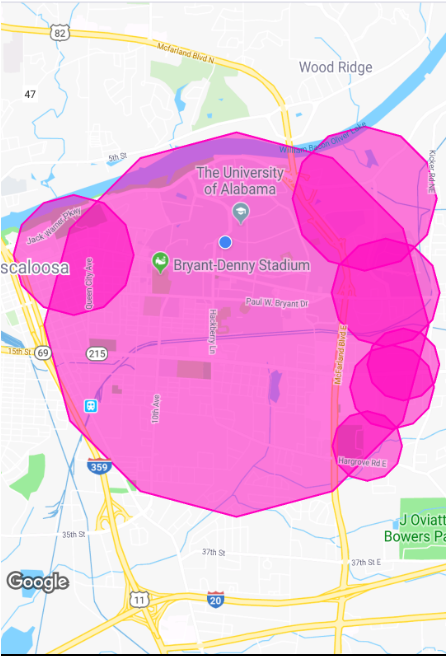 You can also view this coverage area in the ‘Promos” section of your app under Alabama Ride Smart. Q: I don’t have an iPhone, Android, or Windows smartphone. How do I use Lyft? A: Currently, the only way to schedule a Lyft ride is through the app. Always verify your driver and car when you request a ride. When your ride arrives, make sure the driver’s photo, license plate number and vehicle match the description in your Lyft app. Do not get into a car that does not match the description in your app. On your way to meet a friend? Tap ‘Send ETA’ after requesting a ride to send them a text message with an in-app link to your current route and location. If a friend sends you their ETA, you’ll be able to see their progress toward the destination, a photo of the driver, and the vehicle color, make, model, and license plate number. For any questions about Lyft or issues with a ride, please refer to Lyft’s Help Center: https://help.lyft.com/hc/en-us.